Security forces are beating and torturing the nearly three thousand people detained at the Tolai Military Camp. 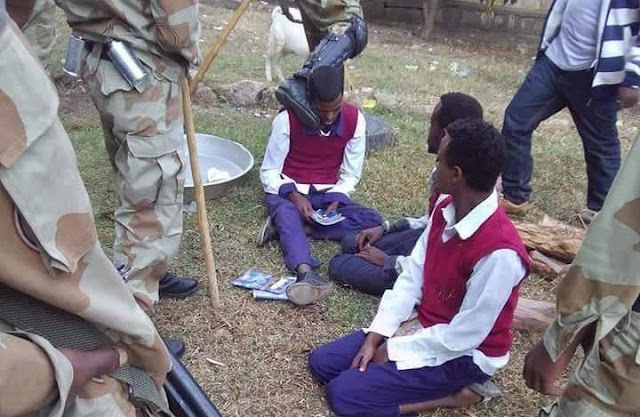 The detainees were incarcerated in mass in the ongoing anti-government protest in the Oromia region for political and economic rights that is well into its fifth month. Quoting his sources, Berhanu Lenjiso, a social scientist who closely follow the protest in the Oromia region, told ESAT that there were 2,800 people detained at the Tolai Military Camp and the detainees were being beaten and tortured by the Oromia police and prison guards. He said, according to his sources, the TPLF officers were the ones directing the beating and torture behind the scene. He said the majority of the detainees were from the Oromia regional state, but there were also prisoners from South Ethiopia, Gambella and Benishangul regional states. Some members of the police who were forced to perpetrate the torture against the detainees have begun challenging the instructions coming from the TPLF officers. Meanwhile, the protest in the Oromia region resumed on Monday in Sululta town, few miles from the capital Addis Ababa. Seven students have been arrested following the protest, according to OMN. In another development, a fire has reportedly broke out at the Haromaya University today. Students told ESAT that the fire engulfed four buildings, which were student dormitories. Students’ belongings were damaged by the fire but the sources could not tell if there were injuries to the students. The University has been the center of the protest by the people in the Oromia region against years of marginalization by the tyrannical minority government. The University was partially open despite ongoing protests in the region.